Count on our family-owned company for premier carpet services, installations, and repairs. Tile services are also available with name-brand products. Hardwood flooring and vinyl installations are available for your residential and commercial properties. Next-day installation is available for all hardwood and vinyl currently in stock at our showroom. Check out our special offers and learn how you can save even more with our high-quality services. Saving you time and money is important to the team at our flooring company. Contact us in Egg Harbor City, New Jersey, to request an estimate from our flooring company. Browse a huge selection of brand-name floor options at our flooring company's 3,000 square foot showroom in Egg Harbor City, New Jersey. 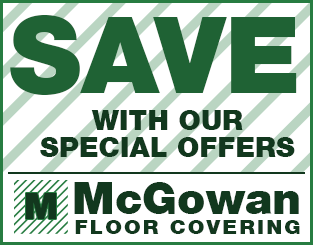 McGowan Floor Covering offers warehouse-direct pricing and next-day installations for any in-stock item. We value your business and therefore offer a lifetime installation warranty. We are fully licensed and insured and are here to serve your residential or commercial flooring needs. Our flooring company gets your installation or repair job done beautifully and on time. Because we do sales, installation, and service with no middleman, we are able to beat any advertised price. Our staff is on call to help you choose the best option for your home or office, and we provide complete delivery and installation services for carpet, vinyl, tile, hardwood, and laminate flooring. Our family-owned-and-operated flooring company is dedicated to excellence in every aspect of your flooring experience, and a large percentage of our business is due to referrals and repeat customers. Our owner is onsite at each job to ensure you receive nothing but the best products and services. "Prompt, courteous, very reasonable service...and the price was great!"